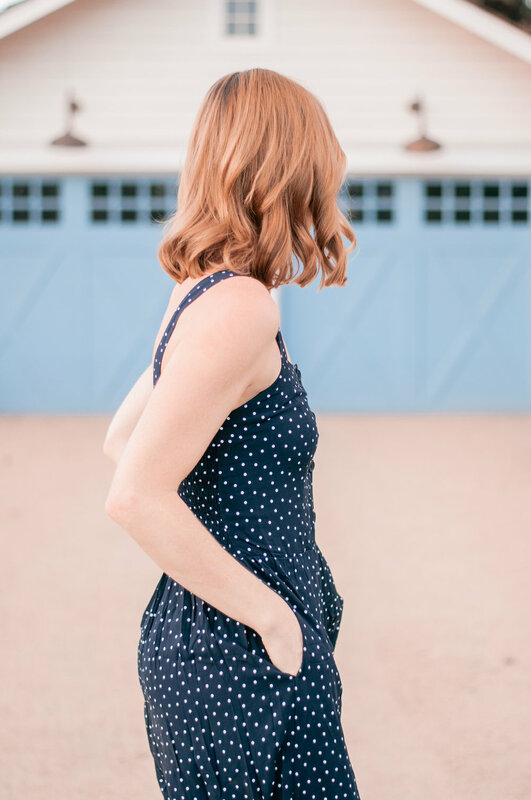 Today I'm talking about another expert way to deal with the whole summer-to-fall wardrobe transition thing by styling the most amazing (and amazingly comfortable) casual navy blue polkadot jumpsuit! Consider this (and jumpsuits in fall-ready color palettes in general) just another piece you can wear now while the weather's still warm and layer later when fall coziness arrives -- because making every piece in my closet work harder and go farther is basically my mission in life! Like I mentioned in last week's summer-to-fall transition outfit post, this time of year is my very favorite on so many fronts. Style, at home, outdoor activity, food ... you name it! So I like to stretch it out and give it as much attention as possible while it's here, even it is technically still summer. I reserve the right to stretch the fall season out as much as possible, and that means that August is fair game, cool? Cool. 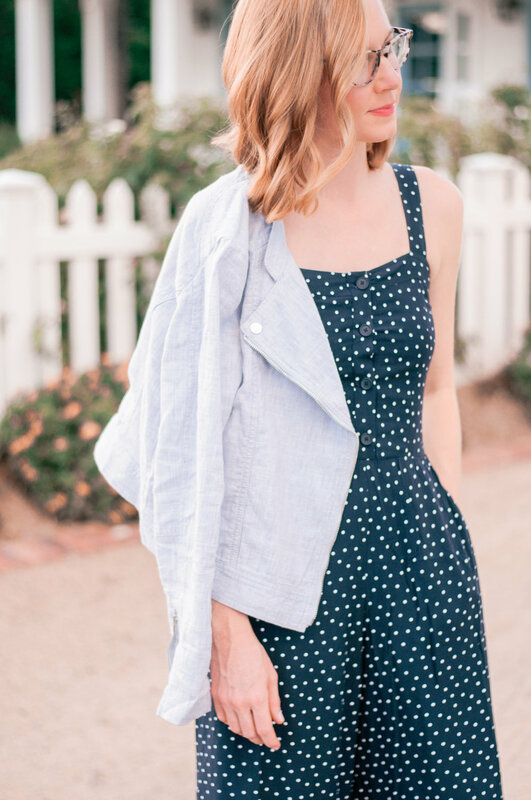 But to be fair, this insanely comfy-cute little polkadot jumpsuit is just as perfect for this warm late-summer weather as it is for the cool fall temps, so I feel like I'm being really fair to summer here, guys. Super fair! Jumpsuits are kind of a love 'em or hate 'em garment that I know they can be polarizing. And I get it! They're super cute, but can not only be slightly impractical (you know what I mean... and if you don't just email me and I'll tell you all about it) in certain situations and definitely aren't all created equal, style wise. 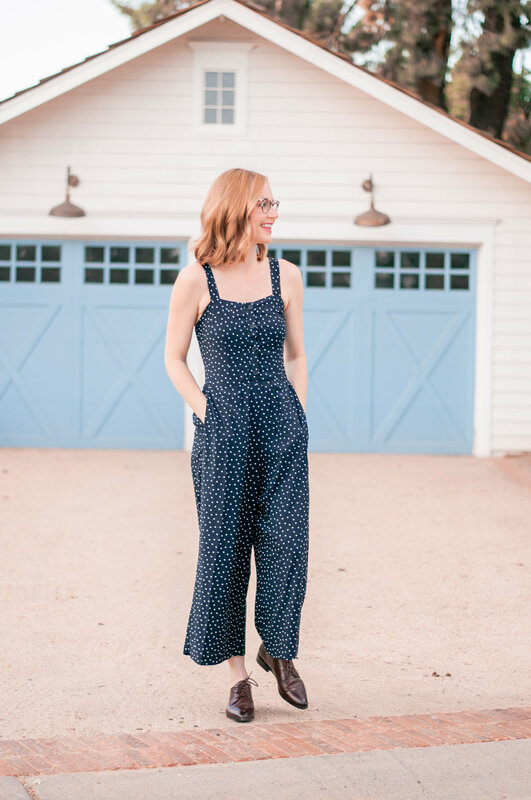 Despite any shortcomings, I just love a good jumpsuit in any season, which is why when I find one that's perfect I get super excited. And take it from me when I tell you that this one I'm wearing today is perfect, for so many reasons. Not the least of which is that it's under $100! First, it's insanely soft and comfortable. The material is slightly lightweight and feels as soft as silk against my skin. Think of the most comfy pajamas you own and that's what this feels like. Yeah, it's that comfy. Next, it fits true to size and the ankle-length inseam is perfect, in my opinion. In my never-ending hunt for the perfect jumpsuits to add to my wardrobe I find that so many jumpsuits have oddly cropped inseams. Why? WHY! I just don't get it. I don't find that cropped, just-below-the-knee or mid-shin inseam flattering on, well, anyone. Including models. Not feelin' it. But so many jumpsuits are made in that style and I can't get behind it. So when I find a jumpsuit in the perfect ankle style I jump on it! I also love the neckline, the slightly thick straps and the button-front. In my humble opinion this is such a flattering neckline style on anyone with any bust size and I really appreciate that it's neither super low cut or made with slinky, flimsy straps. So many jumpsuits that I come across these days have either super low cut necklines (I realize that many women can pull that off with unicorn-like ease. I am not one of those women.) or really tiny straps that can get really weird really fast. The top of any jumpsuit I buy has to be flattering and versatile/appropriate for about a thousand different adult settings that I may find myself in. Another thing to love about this one-piece wonder? The color. 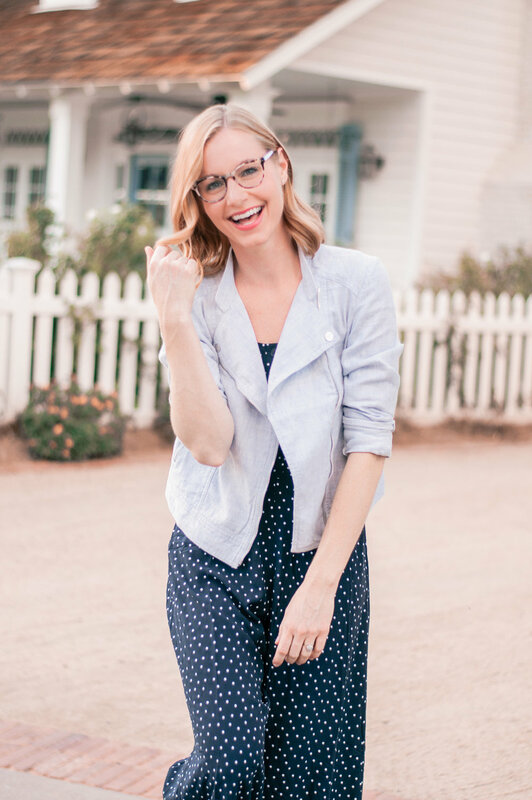 Oooooh that rich navy blue color with those adorable white polkadots. I love a good fall color palette and all the marigold, burgundy and forest green that come with it, but my favorite autumnal color? Navy blue. Always always always navy blue. 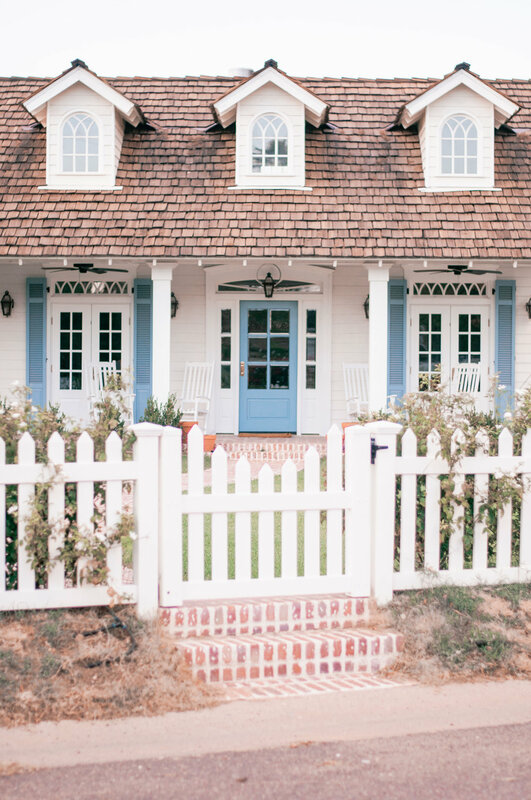 It's such a beautiful, rich, classic (and kind of collegiate... which weirdly always gives me the fall feels) color that not only always makes me think fall, but it can pretty much work in every season. It translates, which ups the versatility factor, which you know is of the utmost importance for me. Remember... I need this wardrobe to work harder for me! So obviously because it's still blazing here in Phoenix I'm pretty much wearing this pretty little jumpsuit on its own for now, no layering needed. But once fall hits I'll throw about a thousand different jackets over this bad boy depending on my mood, like this adorable periwinkle/slightly light blue lightweight moto jacket. 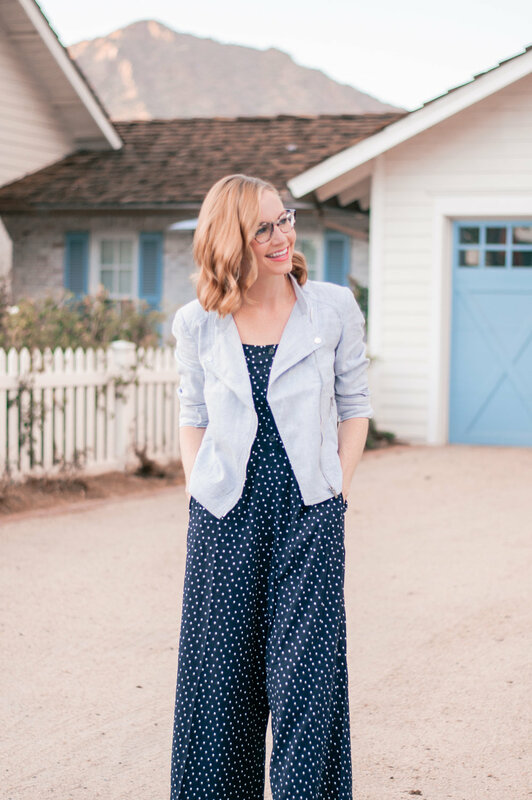 I love what a casual-cool take this jacket is in on a moto style in general, but I also really enjoy the pairing of navy and light blue or periwinkle. Such a pretty, kind of romantic combo. But navy also pairs perfectly with about a thousand other colors, which is why I also threw on my favorite burgundy Frye oxfords to give this getup even more of a fall feel. I've been waiting to break those out of hibernation for months! Oxfords always. I would also love to pair it with this gorgeous brown suede jacket or better yet, this blush version, these heeled mules, these heeled mules and this bag. 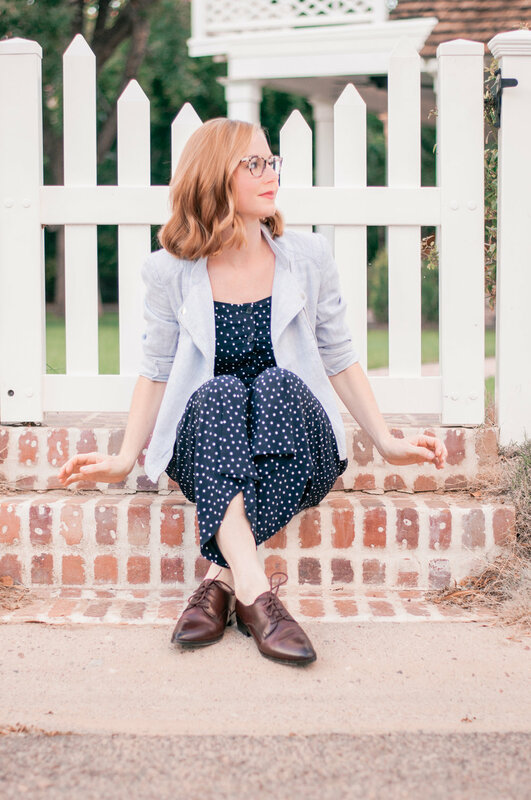 Oh and my favorite tortoise specs that I'm wearing here because... duh. 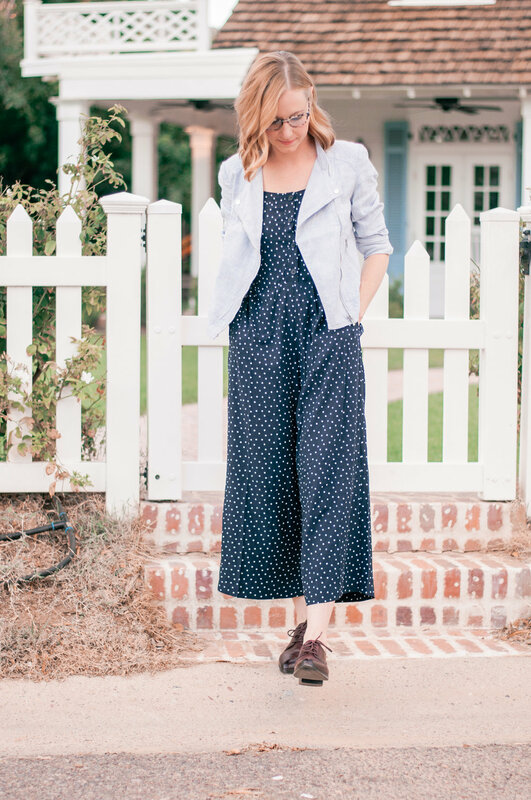 But throwing a jacket or cardigan over it isn't the only way to style your favorite summer jumpsuit for fall! I know I know... so many tricks up my sleeve. 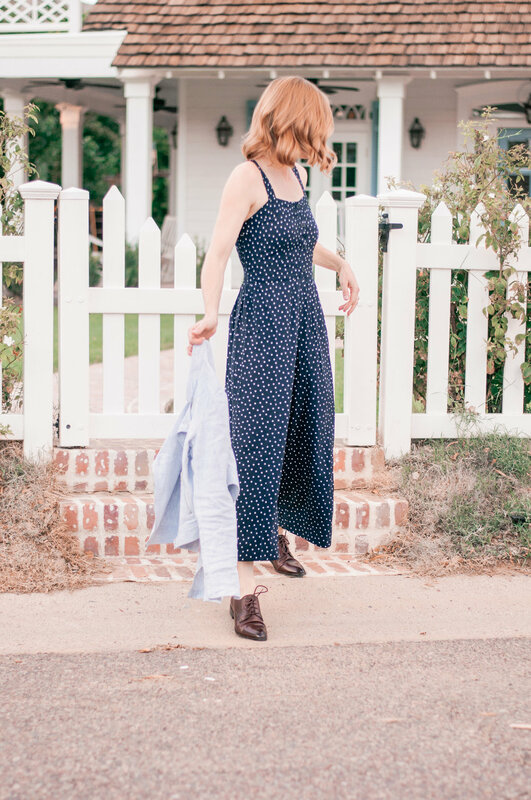 You can also treat a great, sleeveless jumpsuit like this a little bit like overalls and throw a long-sleeved shirt underneath when the weather gets cool -- kind of like this! Or a cute tee like this, or a lightweight sweater, or a more polished collared shirt, or whatever. 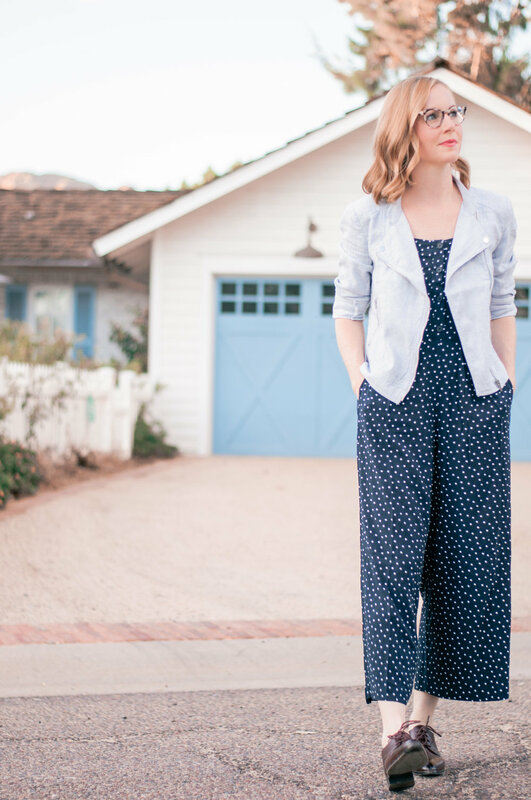 The possibilities for layering are endless and it's such a great way to get more life out of your favorite summer jumpsuit. Ok I have to know -- are you guys into jumpsuits? I feel like I know so many women who love them, and so many women who just can't do it. Also if you are into them, what style is your favorite? What qualities do they have to have for you to love them? Long sleeves? Sleeveless? Cropped pant? 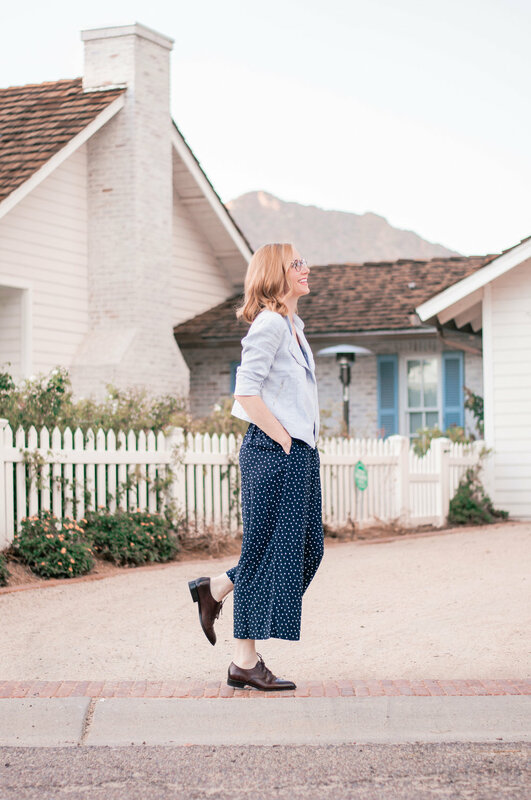 Wide leg pant? Full length pant? As adult women, we need to have this jumpsuit conversation! Our lives... and our continued comfort depends on it!